The Incredible Hulk, The Ultimate Mean Green Destroying Machine! The Ultimate Mean Green Destroying Machine! The Hulk, who is most notably called the Incredible Hulk, is a Marvel Comics superhero. Created by Stan Lee and Jack Kirby, he first appeared in Incredible Hulk Vol.1 #1 in May 1962. This character has since become one of Marvel's most iconic characters and in many instances, ranked second only to Spider-Man in terms of name value. The Hulk was inspired by the story of Mary Shelley's Frankenstein and Robert Louis Stevenson's Dr. Jekyll and Mr. Hyde. The duel personality of the simple-minded and emotional brute springing from a quiet intellectual is the inner dynamic at work here. Indeed, in contrast to the quiet Dr. Bruce Banner, the most famous version of the Hulk is a childlike persona who just wants to be left alone, but is continually forced to battle foes determined to hunt him down. This is also somewhat similar to that of Universal Studio’s 1931 film, Frankenstein. In the first issue of The Incredible Hulk, the Hulk was supposed to be gray. But at the time, the publishers were having difficulties with printing a consistent and clear shade of gray. After the first issue Stan Lee decided to make him green instead, which was easier to print and that color stuck. Subsequent reprints of that story retroactively changed the Hulk's skin to green. This created a false impression that the Incredible Hulk had been that color from the beginning. 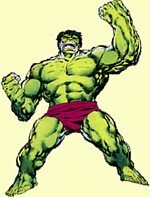 Green stayed the dominant color until 1986, wherein the Hulk reverted to gray, and remained that way until 1991. In the initial creation of the Hulk, Dr. Bruce Banner is employed as a military scientist. His major project at the time was a gamma bomb, a new weapon developed for the military. As the bomb is about to be tested, Banner notices a teenager, Rick Jones, who has wondered onto the test-range in his car. Banner streaks onto the open range from his position of protection to rescue the teen. Rick Jones makes it to safety, but Bruce Banner is caught in an incredible storm of gamma rays as the bomb explodes. This saturation of radiation ultimately intermingles with Banner’s body chemistry and starts turning him into the rampaging Incredible Hulk. The first issue was created with a strong cold war context. The Hulk was captured and taken to a country, although not named, but had a strong assumption to be the Soviet Union. The plots of many of the earliest Hulk stories contain the character, General Thaddeus E. "Thunderbolt" Ross. Ross continually pursues the Hulk, with his elite "Hulkbuster" U.S. Army group at his side. Ross' daughter Betty is an ongoing love interest for Bruce Banner. She often criticizes her father for going after the Incredible Hulk so relentlessly without regard to her feelings for the Hulk's alternate identity. Although, General Ross has little respect for Bruce Banner and often refers to him as a "milksop". Ross doesn’t care for his daughter's infatuation with an intellectual. As luck would have it, General Ross' right-hand-man, Major Glenn Talbot, is also in love with Betty. He is an honorable man though, and is torn between pursuing the Hulk and gaining Betty's love in an honest way. And for a while the teen, Rick Jones, is the Hulk's first and only friend. The Incredible Hulk possesses a variety of superhuman physical and mental abilities as a result of the massive exposure to Gamma Radiation. The most well known superhuman power is his capacity for potentially limitless physical strength. The Hulk is capable of lifting roughly 100 tons while he is in a functionally "calm" state. However, his strength increases exponentially as adrenaline surges throughout his body during times of heightened emotional stress, most notably anger or rage. While in this enraged state, the Hulk is capable of lifting far beyond 100 tons. The Hulk's strength extends to his legs as well, giving him the ability to leap several miles in a single bound. As his strength increases during times of anger, this ability increases dramatically. Under normal circumstances, the Hulk can leap about 3 miles in a single jump. He can though, jump almost into the upper atmosphere while in an enraged state. The Hulk's body is also highly invulnerable to injury. His physique can withstand high caliber artillery cannon shells and impacts that are equivalent to more than a ton of high explosives. He can survive falls from great heights, corrosives, and temperatures in excess of 3,000 degrees Fahrenheit without sustaining injury. It is virtually impossible to cause the Hulk injury through conventional means. However, it is possible to injure the Hulk but his body is able to heal itself from massive tissue damage and blood loss with high levels of superhuman speed and efficiency. Like his strength, it is believed that the Hulk's healing powers increase, as he becomes enraged. In addition to his physical power and healing ability, the Incredible Hulk has demonstrated a couple of supernatural abilities. First, he has the ability to "home in" on the desert base where he was created. Second, The Hulk is able to see and hear ghosts. This ability may be triggered by Banner's fear that his father will return to seek revenge for his death. The Hulk's body also has a gland that makes an "oxygenated perfluorocarbon emulsion". This creates pressure in the Hulk's lungs and effectively lets him breathe underwater. He can also move quickly between varying depths without concerns about decompression or nitrogen narcosis. It is not known if the Hulk has always had this ability or if it has developed over time. The Hulk has evolved through several different personality traits and physical renditions. A more in depth discussion can be found on these personalities on the next page about The Incredible Hulk. Click on over and find out . Now if you happen to be into collecting and reading more, I have researched some excellent resources. Here is a collection of Incredible Hulk comics and back issues . I don’t think you will be disappointed. You may very well find a tidbit or two worthy of your interest. And of course, the ole standby, Amazon has a few items to tickle your taste buds. Just click the image to the left. Don’t stay too long though, and come back here. If you want to keep up on the varied and interesting activities going on in the world of comic books, then feel free to sign up for my newsletter “Comics Galore” in the form below. And by all means, I would love to hear your comments and opinions on the transformations the Incredible Hulk character has gone through. You can sure leave them for me at my contact page in the menu at the left. I may even be able to include them in my newsletter. I thank you ahead of time.